103 drills + 6 minutes per drill + 241 page transcript + 100% money back guarantee = incredible value! Hi Everyone, I am a very old lady, 75 years to be exact, and I am writing because Camille, Olivier, and Leyla have a most excellent site for gaining knowledge of the french language and the ways and customs of France and I highly recommend this family business. I love the verb drills audio!!! Their site, frenchtoday.com, is perfect for me and I expect for you, too, as are their many audio books. Camille’s explanations are very clear and kind to all, and fun, no matter what stage of learning one is at. Their prices are very fair and their acceptance of returns, if necessary, is probably unmatched. Also, any questions sent in are answered quickly with the personal touch that is so very nice. Olivier is the tech, and Leyla, their daughter, is bi-lingual in french and english!! A lovely family, indeed! God bless, C-Marie P.
I am at an “Intermediate 1” level, and never have really mastered the verbs, which are a key in French. I’m working my way through “être” now, and the future tense of this verb is pronounced quite differently that I used to pronounce it, so a big revelation to me. In two weeks I will be studying for a month at the Insiitut de Francais in Villefranche sur Mer, and my hope is that these verb drills will help me to be more ready for that instruction. They concentrate on pronunciation. I love your verb drills. Exactly what I need. A very thorough, intelligent, helpful piece of work which seem to be the hallmarks of this enterprise. The passion to teach French well to us struggling to get it right, is palpable in all that they do. I think Macron needs to be informed of this enterprise for services to the French language. Thank you! Camille and Olivier for your French Verb Drills Audiobooks! Having Real French Pronunciations and being able to listen to them as many times as I need to advance toward a true fluency is terrific. While using Camille’s audio as a dictation it allows me to practice my oral comprehension and writing skills! I absolutely LOVE this Verb Drills package. I can work with them whenever I have free time, and bring myself to a point where I can more easily recall them when the heat is on (like in class), so I don’t get embarrassed as often! ALL of the french today materials have been VERY helpful to me in my quest to become more fluent. I highly recommend them ! Merci Camille et Olivier! Thank you Camille and Oliver for this great drills book. I am an English Canadian who went to school in French in Quebec. We now live in an English speaking province. I remember doing drills in school, but not how to make them effective. They don’t seem to drill in school anymore! I use this book to help my children with their second language French studies. I love the fact that you drill the negative and interrogative form at the same time as the declarative form. I appreciate the encouragement to say, for example, shaypa (glidings), but to see that it is written “je ne sais pas”. I no longer worry about speaking in “French grammar mode”, but “street speak” with my children more comfortably knowing that I have a method to help me teach them to speak and write properly. Merci beaucoup. I’ve been living in France since January and have been working my way through Audiobook level 3. The French Verb Drills are an excellent addition to this. Living in France has really made me see how important the correct pronunciation is. So many times I have found that the reason I’ve not been understood has not been because of vocabulary or knowledge of the correct verb, but it has been because I have mispronounced them. The Drills and the Audiobook really help develop my ear in hearing what people say to me, and in replying to them in a way they understand. Frankly I don’t know how people can live in France without at least trying to learn the language. It’s so nice to be able to go for coffee with my french neighbour and be able to communicate with her. Best french language course I ‘ve used and am progressing well. Exactly what I needed. After more than 5 years of French language I still found myself having difficulty conjugating verbs quickly. These drills solved my problem. I have the “French Verb Drills”, the “Une semaine à Paris”, the “ À mois Pari series”, “French Verbs Fundamentals” and ”Secrets of French Conversation. These series are a superb method to stay current in a language I studied at the University of Illinois in 1950 and 1951. I wish they had been available sooner, but Camille and Olivier first had to be born. I recommend francophile learners and practitioners take advantage of them. The verb drills is a good tool to use to really have it stick in your mind. It focuses on “today’s french” which i really like rather than the old school text book styles. And the customer service was exceptional. I ran into abit of a problem and it was resolved efficiently and to my satisfaction! I like everything about “French today”. These drills were exactly what I was looking for. Thank you for putting together exactly what I needed to practice and become second nature with conjugations. Merçi!! Unique product in the market, great for listening training! Wow what a pleasure. If only I had got these first before all the other French books and courses. This is making me feel like a champion. These verb drills must be a tightly held secret – more people should get these too. Highly recommended and I never recommend. I’m just thrilled- thank you. Love these drills!!!!! As Camille always says, “repetion is the key”. I find these audio drills so helpful in teaching correct pronunciation. The drills can be used for a minutes here and there during my day. Plus, the way they are organized, first, in conguation order, and then randomly, really helps to remember them in a way that will aid actual communication with having to translate from English to French in my head! I know it is hard for you to translate the verb drills and so, you just read out the various conjugated forms. However, I think it would so much better to put all / or some of the conjugations into sentences and say what the the verb forms are you are using. I.e. “Use of Imparfait” – When I was young, I often used to stay in the country with my cousins. – French translation. I think this would be much more valuable. I also purchased A Moi Paris audio book series 4 & Mastering Adjectives. Along with the transcrips, these are very good. Excellent. I’m sorry you didn’t enjoy these drills. Not only translating is quite difficult (several English translations for one French tense ex: “je mangeais” = ‘I ate, I was eating, I did eat’) but it will lure students into thinking they can bypass studying the tense – when and how to use it – which would be a huge mistake. Learning conjugations is a daunting task for me. I could not seem to find any patience, motivation to do it by myself. Every teacher, every french person whom I had asked for tips on how to learn conjugations and use them in different tenses had told me that I just have to learn them by heart. So when I came across the FrenchToday Verb Drills, listened to the sample, read the reviews and realized how it can facilitate my french language learning journey, I decided to buy the bundle. I am not familiar with all the french tenses yet as I have only started learning french a few months ago, therefore, I drill only on the tenses that I know or just learned from school. Obviously, as I move along with my french studies and get familiar with other tenses, I can make full use of these verb drills. Thank you, Olivier and Camille! I am enjoying my other purchases as well!!! Practising verbs may seem boring but on the contrary. Knowing their structures gives confidence in verbal exchanges so highly recommended for all levels. They lead from the hesitant stage to the confident so well worth the investment of time. I love doing the verb drills in the car. Would suggest a new volume solely covering reflexive verbs. I asked and was pointed to a cool feature in the App to rewind the audio by 15 seconds, great for practice ! Keep up the good work, love from Sydney, Australia. Excellent product! This is probably the most helpful resource I have ever used to improve my French. It’s like taking a daily audio “vitamin” for healthy French speaking. Merci, Camille! Ce sont des exercises qui valent le coup. I am new to the program, French Today, but already I am a big fan. I’ve been taking weekly French classes for a year now, and this audio program is EXACTLY what I need to keep by on my toes with learning, memorization, developing reflexes, etc. all during the week! I have noticed improvement in myself already! I also bought the audio books on adjectives, essential dialogues, and more as my goal is to be fluent in French in my lifetime! Never too late! Just what you need to better recall verb tenses and forms. I am using these whilst driving in the car and it is helping me immensely to grasp the different tenses without having to “work it through ” in my head before speaking. Thank you, I will definitely be looking to purchase other volumes. The French drills are outstanding, and provide excellent practice in developing proper pronunciation accent and speed. Also, gives student the opportunity to develop ‘memory’ for verb tenses in critical verb groups. As a long time student of French, I have found this series an invaluable tool for renewing my knowledge of verb conjugations, and proper diction. I have several other audio products in the past but have found those offered by Frenchtoday to be by far the best value – well worth the purchase and then some. The audio stories are also ideal for gaining back the ‘ear’ of normal street level French. Excellent will continue to buy here. I have been studying French sporatically for the last 10 years and have purchased many books and programs over these years. Two months ago I discovered French Today. What a find! One of the items purchased was the Verb Drills. The French Today App is loaded on my iPhone and iPad so I can take it with me anywhere and practice the oral verb drills. Even when I am not ‘plugged in’ I am repeating the verbs and their tenses aloud or in my head. In the words of Camille…”repetition is the key”. Best Verb Practice Tool ever.. I started studying French a year ago for pleasure, and I am starting my intermediate studies. I use a variety of study methods to keep things interesting so that I stay motivated. I started using the French Today verb drills and the first audiobook very early in my studies. They have been so helpful both in learning French vocabulary and in learning to pronounce things correctly. Recently I received a compliment from my French teacher about how clearly I speak French – she says I am very understandable. I attribute this to the time that I have spent with the French Today verb drills and audiobooks. There are a lot of people on the internet trying to sell things to French learners, and some of them are a waste of money and don’t actually work. French Today is different. The verb drills and audiobooks are very useful and can be used in a variety of ways to help you study – as Camille explains in the introductions to everything. Using the instructions provided by French Today, I have not had any problems using the materials on my computers (both Apple and Windows) and on my iPhone and iPad. It has been easy to use them on all of my devices. Now that French Today has its own app, I suspect it will be even easier. Thank you Camille and Olivier for the work you do through French Today! As a new student I find the lessons comprehensive as well as easy to use and understand. It’s one thing to analyze the verb conjugations in writing & another to LISTEN then be QUIZZED for them ORALLY. This method definitely reinforces what I’ve learned abt the different ways of conjugating verbs & at the same time helps boost my confidence in applying them on (future) live conversations. Great product! Thank you Camille for frenchtoday. I’m so glad to find your website and ever since I always look forward to your daily posts on facebook. Not only I’m learning the beautiful french language but also everything that is French. 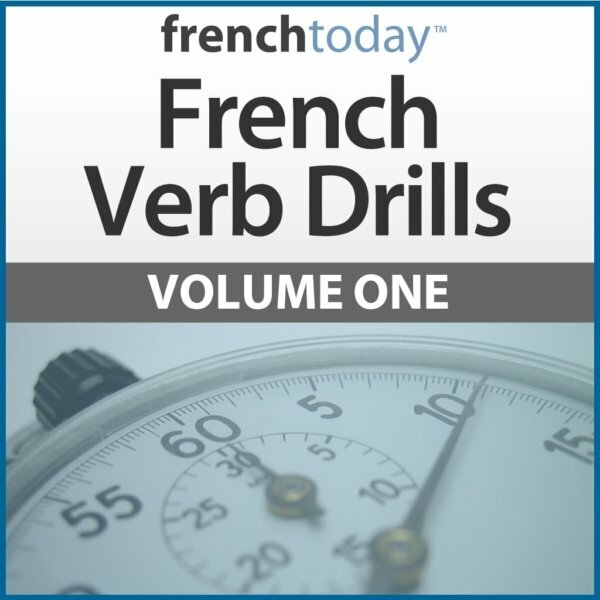 My very first audio book, French Verb Drills Vol 1, is an excellent tool. It’s helping me a lot with pronunciation and listening skills. I can’t thank you enough. Seems an excellent way to manage French verbs. I recently ordered both Une Semaine à Paris and the Verb Drills and am so happy to have found this resource. I’ve been looking for a way to improve my understanding of spoken French and my pronunciation, and I’m finding Une Semaine à Paris to fit right in with my level of comprehension. I’m challenged without being discouraged and can say “hooray for me” when I understand the gist of the story without the written words in front of me. The verb drills are wonderful for helping conjugations to become automatic and the audio is giving me a structure for daily practice which I couldn’t seem to accomplish on my own. Thank you so much for all the work you have put into helping so many people learn and improve their French. I feel as if I have a friend in France! I am enjoying the French Verb Drills vol 1. It is an eye opener. It is a great companion to my Rosetta Stone lessons. I bought these for my son (age 11) who is learning French with me at home. It seemed very important to learn the correct pronunciation and also to begin the discipline of learning something well. We have both found the instructions clear and helpful and the pronunciation guide is excellent. We are getting great value from the material. Thank you very much for providing this in a straightforward manner, with a clear, easy to follow structure. Great material; it covers everything. And it is true that “repetition is the key!”. I use the drills when working out at the YMCA. Most everyone is connected so I can speak softly and not disturb anyone! Love the pronunciation practice and since I am a beginner, it is helping me to speak correctly from the start. I have loaded the drills on my Kindle, along with the beginner narrative so my study is portable. Thank you, Camille, for your dedication to your teaching vocation. 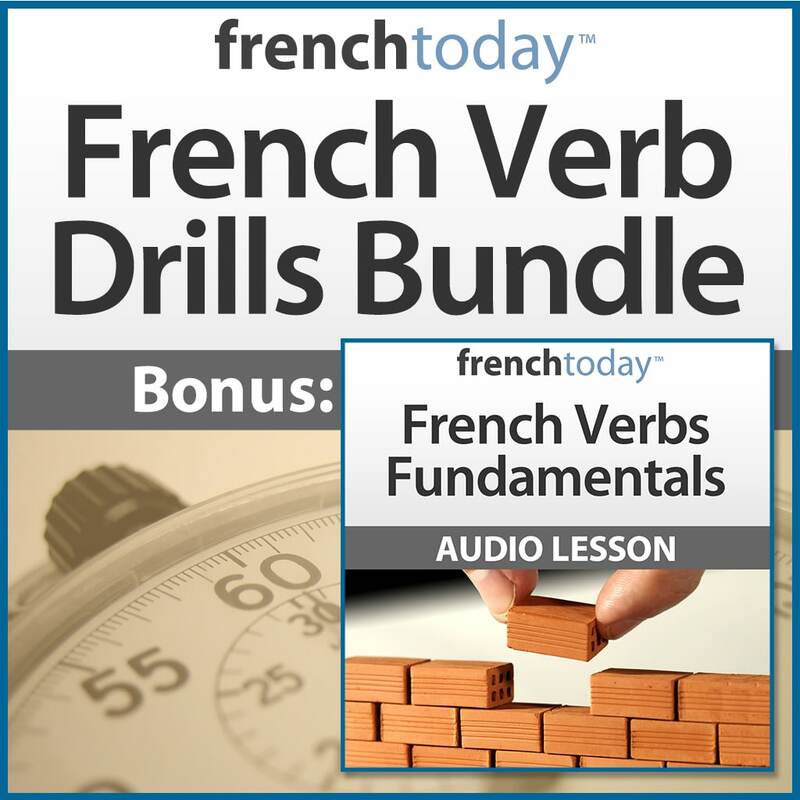 I found the “French Verb Drills” audio book thoroughly enjoyable and easy to follow. A very pleasant voice emphasizing liaisons and glidings (so important, yet not always intuitive) invites you to practice and memorize verb conjugations. I have always felt intimidated by using forms like Future Simple, Conditional Present. or Subjunctive. After a couple of rounds of listening and repeating, I started feeling more comfortable. I find the audiobooks very useful and plan to buy more. Thank you French Today! Very good learning system. If you like to be organised in your learning you’ll like this. I’ve purchased both Secrets of French Pronunciation and French Verb Drills. They’re an excellent resource and easy to follow. Camille has a great understanding of the pitfalls and difficulties of learning French and there are always little helpful tips in pronunciation and usage. These products have been a great help to my French skills and I will be buying more eventually. I’ve also recommended the FrenchToday website to my friends. A great series. The verb drills are like taking a difficult medicine from a wonderful nurse. She gets you through it all and makes you better for it. I expect to purchase more lessons from her in the future. Volumes 1, 2, and 3 of the French verb drills are a must for improving your speaking fluency. I am much more comfortable speaking now that my verbs come to me more quickly and naturally. Hearing the pronunciation of all possible tenses and persons (also inyertogative & negative) is so much better than just looking at the standard written conjugation. The drills give you practice in random order and that has been enormously helpful. Great product. I love the verb drills! I use them in the car a lot. I know the conjugations, but when faced with the on-the-spot recall required in conversations, I can freeze and not be able to produce the right conjugations. The verb drills let me practice reinforcing the sounds, so they come more automatically. It’s a great idea! My only (small) criticism is that each drill repeats the same instructions and I have to fast forward through the instructions on each track. I would like it much better if the instructions weren’t repeated each time. Thank you again for a great product! These verb drills are perfect and can be used anywhere. I even listen to them while cooking !! Its simple, repetitive (which is what you need) and really increases your confidence. I particularly like the way the drill covers the interrogative and negative as well as the affirmative, to help you memorise the correct way to speak and form a sentence or a question. This is exactly what I needed a no frills drill of verbs in their different tenses. Repetition really does the job, it’s not the most interesting or fun process but it works and is the perfect accompaniment to use with other texts and audiobooks. It was also great to hear the proper pronounciation of all the variations of each verb. I have bought and used a few of Camille and Oliviers products and found them to be excellent, helping to improve my French spoken and listening ability with more ease than I thought possible, the use of stories in context is brilliant, my confidence is growing daily. I decided to buy French Verb drills and have found it to be extremely valuable in improving my pronunciation and understanding of each verb tense, past, future, conditional subjunctive and interrogative etc, each proving to be quite daunting in the past. 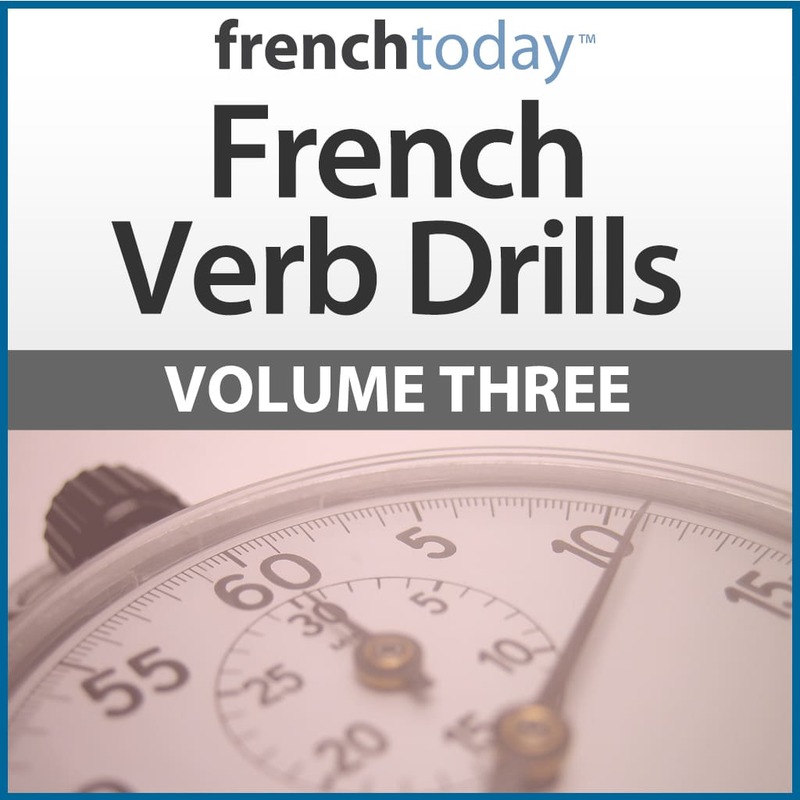 Excellent resource for learning French verbs. Merci, Camille! Actually, this review is for French Verb Drills Volumes 1, 2 and 3. I listened to all three regularly, and it made a big difference in my ability to speak. Excellent products. Worth every penny. I thought this might be a helpful practice aid while driving in my car, and I purchased all three sets. That said I wasn’t quite expecting how challenging these would be, I mean that in a positive way. Take for example être I thought of course I know this verb inside and out. Yet the truth is, in most of my written and spoken French with my pen pals and the other students in my class, I most frequently use the first person and second person familiar forms. As I started the first drills, I suddenly realized I wasn’t quite as sharp as I thought I was with the other conjugations. These are really helping me to be able speak French and not think about what to say and then speak French. I have even noticed that after two weeks, my listening comprehension has improved significantly. That was unexpected. This is a great learning/practice tool and I highly recommend it! I have purchased all of the French verb drills series and have found them all valuable. Using these verb drills as practice, it allows me to think on my feet much quicker when in a conversation. I used to have to run through the conjugation of a verb in my head whilst in conversation. Very time consuming. I think you will find these very useful in your quest to master French! I purchased all 3 volumes of the verb drills after using the sample online and I am very pleased. My French is already at the C-1 level, but my speech is still hesitant and filled with errors. I have gone through all of Volume 1 carefully and am now in the midst of Volume 2 and I can see the results, particularly in my pronunciation, but also in the speed of my response. I also bought and used the French Pronunciation volume. I have been able to correct several of my persistent mistakes in pronunciation. I recommend them highly for the motivated learner. I haven’t found this type of drill/practice anywhere else. I purchased this download a few years back and recommend it highly. After attending a French immersion school this past summer, I was glad to have such a tool. Camille is absolutely correct in that repetition is imperative so that you can switch between tenses automatically; and the only way to do that is with practice. The audio recordings are high quality and the pronunciation is clear and concise. This is an excellent tool for anyone trying to learn French or maintain their French proficiency! These are terrific exercises! Even though I knew most of the tenses, I feel like these solidified my knowledge and the foundation of the french language and find this to be an invaluable resource! It helps to get the nuances of the french pronunciation down and this is a resource that I have already recommended to those around me. I found this very helpful because it helped me to learn the structure of the verbs in the different tenses and it also helped me enormously with prononciation and with my glidings and liasons. I have now lived in France several months and this course has really helped me. This kind of repetition is essential to developing conversational reflexes and is sadly lacking in most French programs. I have a native French tutor but working alone between sessions was proving to be quite hard. Memorising French verbs is not so easy when you are older and I wanted an aid to assist me. Well I certainly found it here. These drills are extremely helpful and make the effort less of a chore. I have bought all three volumes and can’t recommend them highly enough. I like the drills a lot. This is exactly what I needed and have looked everywhere to find. I only have two concerns. One – I wish I could see the speaker pronounce the words because I don’t think I am hearing them correctly sometimes – especially the forms of “Faire” in the imparitive. A You Tube video or at least a description of how the word is formed in the mouth would help. Also, I really don’t like that at the beginning and end of each and every drill for each and every tense I have to listen to a commercial for FrenchToday.com. I bought the thing, I don’t need to be persuaded 1000 times to by it again. That is the only reason I didn’t rate it 5 stars. Camille ensures that your verbs will sound “parfaits” if you repeat after her. I found the exercises to be very useful and they have given me confidence.